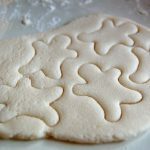 In the first part of this 2-part salt dough ornament post I shared the salt dough recipe and how to bake it here. 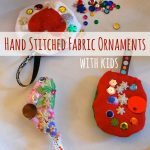 In this post I’ll give you my best tips for painting and decorating salt dough ornaments with kids. Let me start by saying that these were made as a collaboration between me and my 3-year old. I love how they turned out, and how my 3 year old can proudly share gifts from her heart with her friends. Acrylic Paint. This set gives you a wide variety of colors. Small paintbrushes. A set like this will give you a variety of brush sizes and choices. Glitter. Martha Stewart makes a set that comes 12 colors. Cover the table. Acrylic paint will not easily come off of surfaces and clothing. Set this up outdoors. Always a wise move if glitter is involved.Even if it’s freezing, it’ll be worth it. No glitter? Indoors will do the trick. 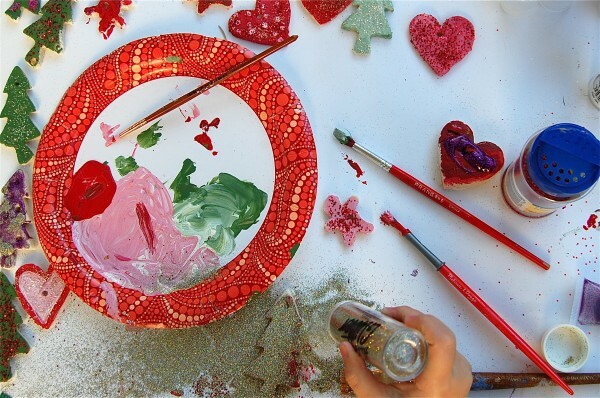 Palette: Use a paper plate for a palette and squeeze small amounts of paint on the plate. Paint: Use acrylic paints. Don’t mess around with tempera. Acrylic is archival and the ornaments will look beautiful when you take them out year-after-year. FYI: Acrylic paint will not wash out of clothing. Add some shine. Use glitter or metallic paint. Make it sparkle. It’s the holidays, after all! Limit the palette. I limited ours to red, white, and green. For Chanukkah, you could use blue, white, and silver. 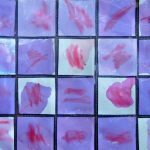 With young children, fewer paint choices make things simpler. If you follow these steps, when you’re done, all you should have to clean are the brushes and hands. N got pretty good at painting the ornaments while maintaining minimal contact with the paint. She wanted to use glitter glue, sometimes all by itself and sometimes on top of paint. The beauty of having a ton of blank ornaments is that they’re ripe for painting experiments. No two ornaments were the same. Painting the glitter glue was fun, too. 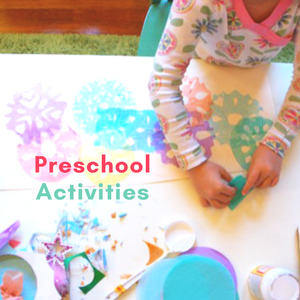 …dumping the glitter like snow, all over the ornaments and workspace. 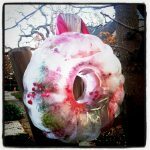 Once more, so happy that I took this project outside. And lucky that it wasn’t a cold or windy day. And there they are, ready to be strung with ribbons and hung somewhere festive. 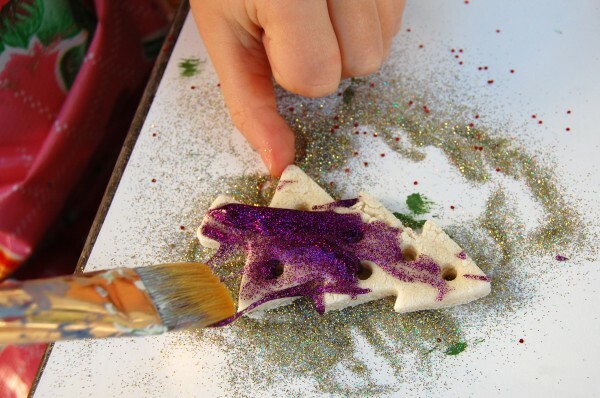 The glitter sticks right to the acrylic paint, but as a final step, you could seal these with clear acrylic medium like this , which would help keep all the loose glitter on the ornament and off of everything it brushes against. 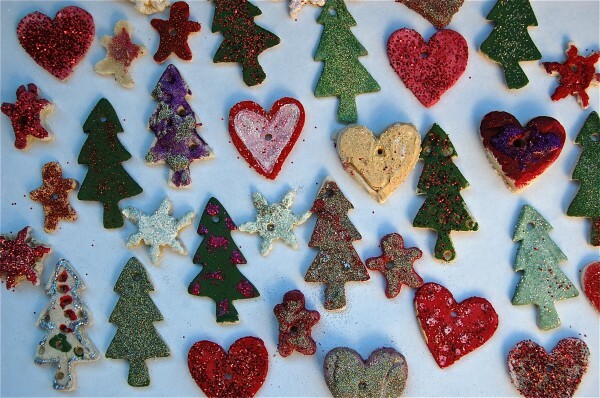 They really came out beautiful!Â There’s no way we could do that outside here though.Â It’s a bit hard to do all that stuff when you’re wearing puffy mittens :).Â I absolutely LOVE the glitter.Â I wasn’t really interested in salt dough ornaments, but now that I’ve seen these, I might change my mind. They turned out beautiful! Love your collection of glitter! 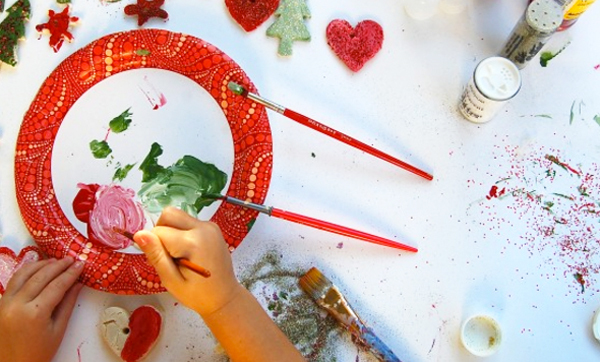 I used a lot of glitter glue with C when she was 2 and 3….the huge rose art kind were easy to squeeze! Janitors in schools hate glitter, Â but art teachers LOVE it! No matter how self contained you keep Â the glitter, it still ends up all over ! 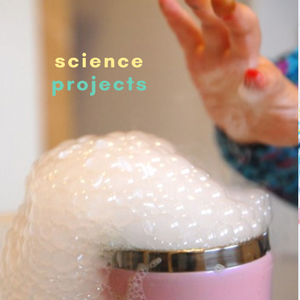 Â Especially when passing back projects adorned with glitter! Beautiful post! These are absolutely beautiful and great gifts. Thank you for the tips. :> Happy Holiday making and celebrating. Thank you, Sheau. Happy holidays to you too! I’m a glitteraholic – as in I need a 3-step program 🙂 Â Beautiful ornaments and looks like she had so much fun! Â We’ve made some, but never got around to the painting part. Â This year, we’ll definitely have to. I wonder what that 3-step program would look like, Chrissy?! Yes, definitely paint them this year…I think it’s worth it! they look amazing!!! i’m impressed by your fearlessness of the glitter! beautiful job, N! We’re in the camp of glitter love! We love glitter, but don’t use it all the time.Â I just don’t have time to clean up glitter everyday.Â It’s me vs. three boys since my husband travels every week.Â The ornaments are beautiful! Ha! Mom v. 3 boys does not bode well for healthy + frequent doses of glitter. You’re off the glitter hook. Love glitter but of course hate the mess. And seems my son loves it because of the mess! 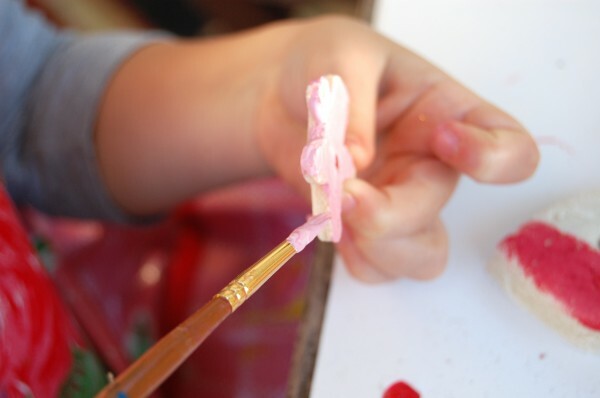 We are lucky to have a place like this close byÂ http://www.froggysartsandcrafts.com/ For an hourly rate you can paint, stamp, glue, glitter, etc – all at their place, then walk away from the mess. We do all the glittering we can there! These are so pretty! 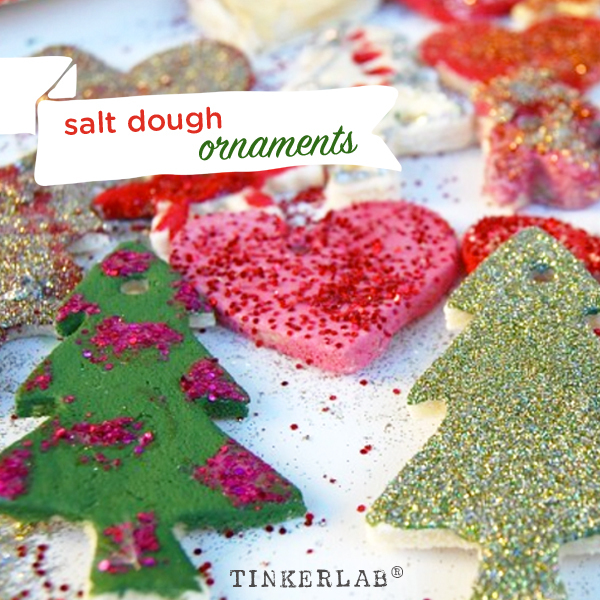 Love salt dough ornaments, and the glitter is very pretty! 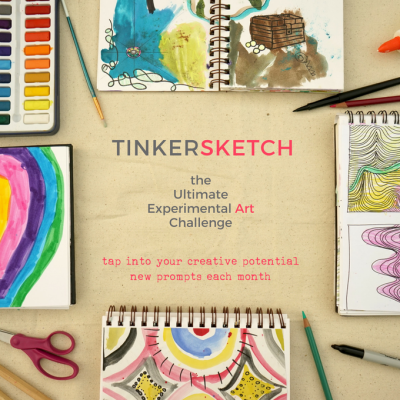 What a great project to share with little ones. Â Every speck of glitter you find throughout the year will be a happy reminder of the fun you had. Isn’t that a lovely way to think about it? Hopefully all of our friends will feel the same way! 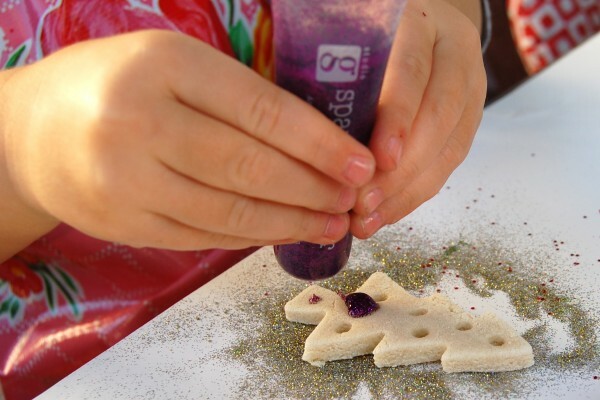 we used glitter paint – much less mess and still lots of sparkle. i LOVE the stuff!! We finally finished ours today – 3 days process but the girls (& I) are so pleased with how they came out! It was our firt time making salt dough! What took me so long???? 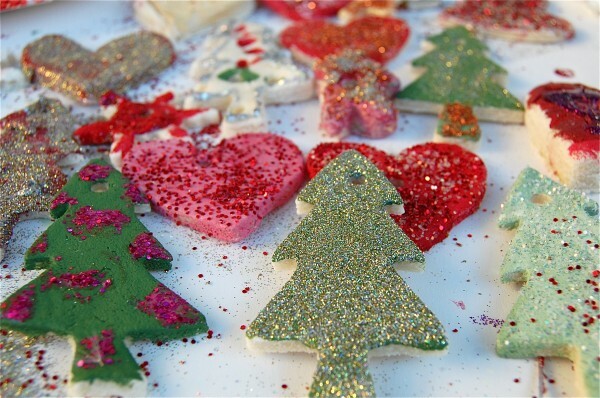 love your ornaments – sparkly delightful! Oh no, Benadette, it took me forever too! Forever! Like 2 days to dry the ornaments, another day to paint, another day to string them with ribbon. It’s involved! Pat yourself on the back for getting through it. I will add glitter to anything! Doesn’t it just make it more fun and beautiful? Well I suppose sometimesÂ when glitter gets everywhere in the classroom and the janitors are pretty frustrated by it the fun and beauty gets lost by them,Â but it’sÂ still worth it! glitter is ridiculously messy, but it does make everything look better! i still have a bowl of glittered pine cones that we made last year for no other reason than they’re covered with beautiful shiny glitter! Did these just before your post. I totally agree with limiting the colors- three or four is plenty. Our glitter came out as well, along with those sequins and other little decals. 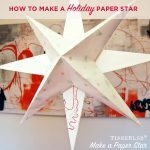 For really little kids or for a quicker project the Elmers markers work great for coloring the ornaments if you are not willing to paint. I also had the same problem with you – having to add water and flour to get the right consistency. Something that I found makes the baking faster is to make use of your top shelf and than switch halfway. Also flipping them like pancakes works great. Let the children free roam once the creative supplies come out. Personally, i used the flower bouquet wire found at craft stores to make durable and relastic hangers. 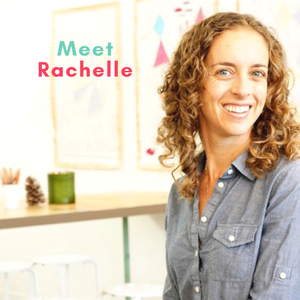 Thanks for sharing this project! 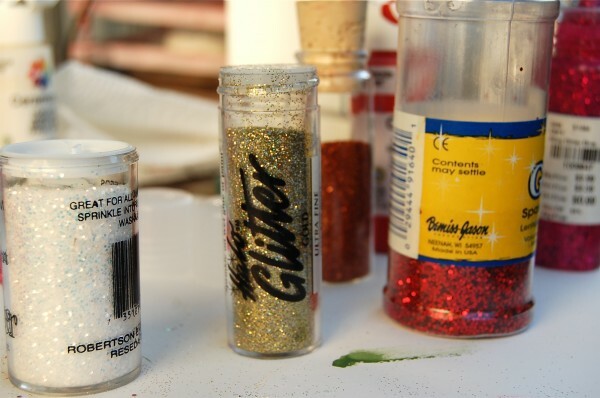 What about pre-mixing the glitter into the paint? Would that work? My 3-year old loves glitter glue, but it’s a bit more gooey than we like for painting. I love your ornaments! I think we will give it a shot this week! That’s a great question! I’d recommend mixing the glitter into a bowl of white school glue, and then painting the glue mixture on top of dry paint. Have fun! Thanks for sharing your photo, Sheau. It looks like some of the bears have belly buttons, too. They’re lovely, and we definitely have to try it with stamps next year. It’s such a nice effect. Happy holidays! These are beautiful. 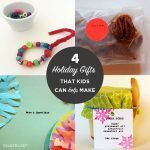 Thanks for the inspiration, we will be making them this Christmas! 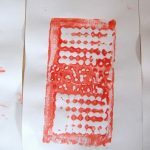 I just wanted to point out – be very careful when buying and using acrylic paint with toddlers and always look for a non-toxic version (for kids). 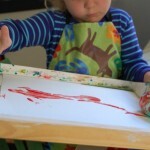 Acrylic paint in general contains ingredients which are dangerous to kids and pets.